We create a world in which plants become part of our energy system and where technology and nature will merge. Living Light is a lamp, which harvests its energy through the photosynthetic process of the plant. The light will be activated by softly touching the plant. The available amount of energy depends on the well-being of the plant. With the three integrated LEDs breathing in and out from different positions, magical shadows appear. You can discover the shapes of the plant in another dimension and turn your interior almost into a forest. From hand-blown glass to 3D printing, every Living Light is a highly crafted object, locally made. As a product we want it to be not only sustainable, but also a cherished and valued object. We designed the Living Light to be very easy to maintain, it just needs a bit of sunlight and water. Thanks to the water reservoir, you will only have to give the plant water about once a week. 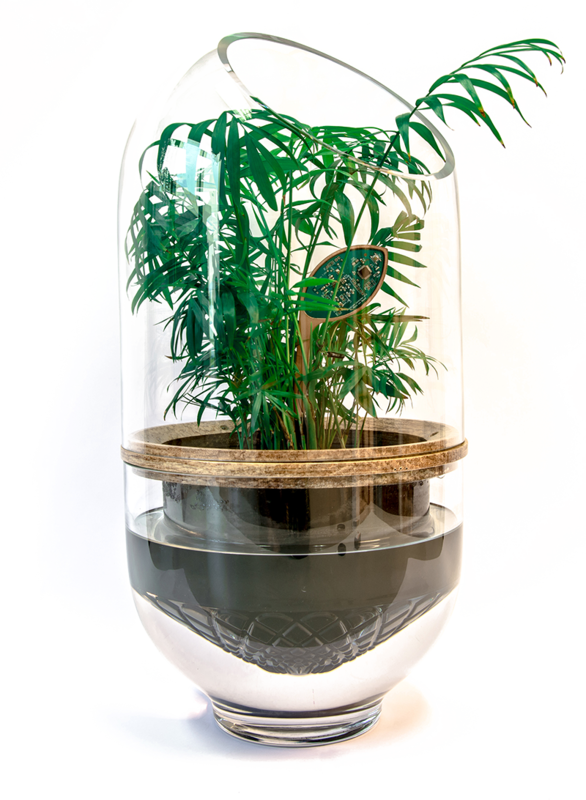 The first product for your house working on a biologic ecosystem. No cables or batteries needed, just mother nature. The first step of plants becoming part of our energy system. In the design of the Living Light we have taken sustainability seriously. We’ve looked at long lasting, quality materials which would impact the environment as little as possible. Therefore, we have chosen bamboo as the material of our LED holder: as bamboo generally grows extremely fast and takes relatively little space and water to grow. preserves something precious: the microbial fuel cell. of the plant becomes an easy job. The Living Light team is currently working hard to make this sustainable technology stable and reliable. As we are not only depending on new technologies in our research and development phase, we also have to discover the secrets of nature which makes this process a time and energy consuming practice. In this process, we are constantly fascinated by the sophisticated complexity of nature, but this also means that we have to ask the first adopters to hold on tight and be patient in this journey: Although it is a technology with enormous potential, the road towards success is quite rocky. *The first 50 lamps will only be delivered in The Netherlands. What will the price be of the first production? From hand blown glass to 3D printing, every Living Light is a highly crafted object. We will start with a limited edition of 50 Living Lights, for which the price will be €1500,- excl. VAT. What type of plant comes with the Living Light? Delivered with the Living Light comes a pre-selected plant. The exact plant which will be included is still to be determined. You can also put your own plant in the Living Light but we cannot be accounted for the risks of lack of functioning of the Living Light when you decide to do so. The technology integrated in the Living Light does not affect the plant or its (natural) surrounding. So you do not need to worry that the ecosystem is being harmed by the technology. And if for whatever reason the plant dies, you can replace it by one of the specified Living Light plants. After the new plant is adapted to its new environment, the energy system will recover itself and the Living Light will again be up and running. You can also put your own plant in the Living Light but we cannot be accounted for the risks of lack of functioning of the Living Light when you decide to do so. What is the amount of light per day? As the integrated technology in the Living Light is based on natural processes, the amount of light which the plant generates can differentiate from several minutes until an hour per day. The amount of light per day depends on the health of your plant and the variances in the environment. For the best light effect, we do recommend the owners of the Living Light to use the Living Light in a dark space. In this way the magic of the Living Light is more visible! How much energy does it produce? The amount of energy produced depends on the wellbeing of the plant and environmental circumstances. The amount of light depends on the periods of rest between the activation of the light. Just like we have to catch our breath between running, this plant needs to rest and regain its energy before you can put the lights back on. Although it is currently just a little bit of energy, just enough to power your LED lights, we believe by putting this technology at an early stage in the market, the technology will gain more attention and, thereby, be developed way faster than if we would only leave it in the laboratories. What is the best spot to place the Living Light? The Living Light needs to stand in a place where at least some sunlight comes through. And although the selected Living Light plants can endure a shady location, no light at all will not be in favour of their energy production or their wellbeing. Furthermore, do have in mind that you are bringing a designer piece into your house which is quite an eye catcher! The size of the Living Light is 56x27x27 cm, so give it the wonderful spot it deserves! What maintenance needs the Living Light? The people who will buy the Living Light will be supplied with an instruction manual which will guide them through all the bits and pieces of the Living Light. Luckily, the Living Light is designed is such a way that it is easy to take care of. The Living Light is supplied with a water reservoir which needs be filled around once a week. The minimum water level is indicated. Finally, the water reservoir and the glass vitrine are both very easy to clean. We will only deliver the first fifty lamps in the Netherlands, as we want to provide the first customers with the best and adequate service possible. Hopefully we are able to ship the Living Lights to other parts of the world in the upcoming years! Do you believe in the power of the Living Light? Do you want to shine a bright light on this groundbreaking application which will accelerate the energy transition? Then support us with a little contribution so we can take Living Light to the next level!